Check Out The Trailer for Woody Allen’s ‘To Rome With Love’!!! 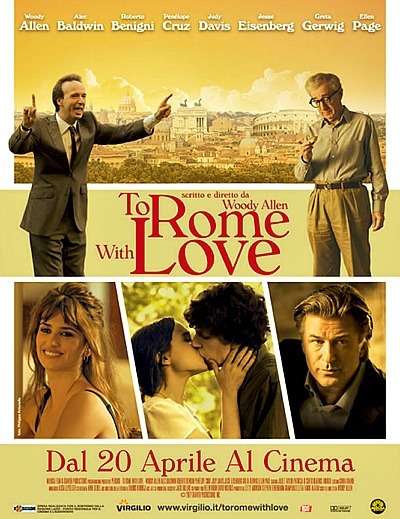 Here is the trailer for the Woody Allen film, ‘To Rome With Love’ starring Ellen Page, Jesse Eisenberg, Penelope Cruz, Alec Baldwin, and Woody Allen. The film will open June 22nd and let’s hope it does as well as his Paris film . According to imdb – “… story about a number of people in Italy, some American, some Italian, some residents, some visitors, and the romances and adventures and predicaments they get into.” Looks good. This entry was posted on Tuesday, April 3rd, 2012 at 11:56 pm	and is filed under Film, News. You can follow any responses to this entry through the RSS 2.0 feed. You can skip to the end and leave a response. Pinging is currently not allowed. « McLovin’ Set to Star in ‘Friend Me’, A Pilot for CBS!!! [to communication device] With all due respect, the ambassadors for the Supreme Chancellor wish to board immediately. [on view screen] Yes, of course. As you know, our blockade is perfectly legal and we'd be happy to receive the ambassadors.